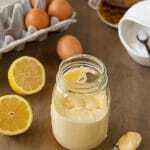 Step-by-step instructions to make your own homemade mayonnaise. Place all of the ingredients into a narrow jug or bowl. Use a stick or immersion blender to combine the ingredients. You'll notice that almost immediately the mayonnaise will begin to emulsify. Blend until combined. Taste for seasoning, and if the mayonnaise is a little thicker than you would like simply add more canola oil and blend. The mayonnaise will keep in an airtight jar in the refrigerator for up to 2 weeks.